If you are diagnosed with Stress type of Headaches or Migraines Dr. Barsoum will guarantee 77% reduction in intensity and frequency of Migraines incidents with a new revolutionary dental device. Place your fingers on your head where highlighted in the illustration below and firmly clench your jaws. Can you feel the huge temporal jaw muscles bulging under your fingertips? It's those muscles that trigger most migraine pain. Dentists usually hear about intense jaw clenching when patients complain about TMJ - a very common and painful jaw disorder caused by clenching tightly in an off centered, lopsided way while asleep. The dentist often makes a specialized mouthpiece (like the one shown here) to balance the bite for the TMJ suffer. But this type of mouthpiece may also cause increased jaw-clenching intensity - and make the pain even worse. People with migraine pain suffer a lot. Medical examinations often show, however, that they're otherwise perfectly healthy. A recent medical study confirmed that people who suffer from migraine pain and chronic headache clench their jaws in a balanced, centered position. This causes extremely intense muscular contraction, but little strain on the jaw. Nighttime jaw clenching usually goes unnoticed - but it sets the stage for migraine pain and chronic headache pain. Your dentist now offers the NTI-tss® device that reduces clenching intensity by 66%! 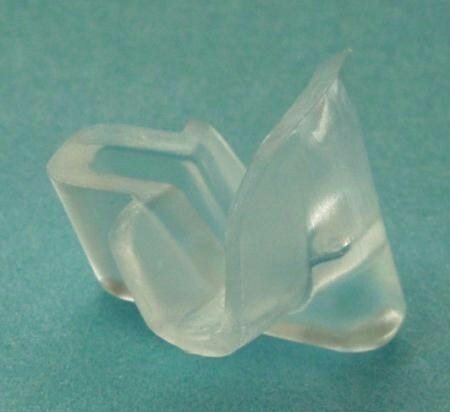 The NTI-tss® device is small, nearly invisible, removable device that you'll wear when you're asleep. You can also be fitted with a removable NTI-tss® device to wear all day long. Unlike the traditional mouthpiece with a flat surface, the NTI-tss® device (below) is a custom-fitted device that prevents the tooth surfaces from ever coming into intense contact. By preventing high-intensity contact, you also eliminate high-intensity clenching - and the muscular irritation that leads to migraine pain, TMJ, and chronic headache. Put a wooden pencil between your upper and lower front teeth...and bite down. 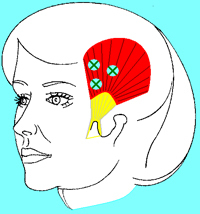 The muscles under your scalp contract only slightly, because intense contraction cannot occur. That's how the NTI-tss® device works. TMJ patients may benefit from the NTI-tss®. And clinical trials have proven that 82% of migraine suffers had a 77% average reduction of migraine incidents. So if you suffer from migraine pain, chronic headache pain, or TMJ...tell your dentist about it. The NTI-tss® device may help you. If you have any questions about Migraines or Headaches, please contact Dr. Maher Barsoum at our Chino or Upland office or make and appointment on-line!